For recurring orders, the date that you first purchased a subscription will be your billing date. For example, if you bought a ButcherBox on the 1st, your order will automatically be processed on the 1st of the month. Expect your box to arrive 3-5 days after your billing date. The date your order is processed is the same each month unless you change it. If there are only 28 days in the month, and your regular billing date is on the 29th - 31st, you'll be billed on the 28th. 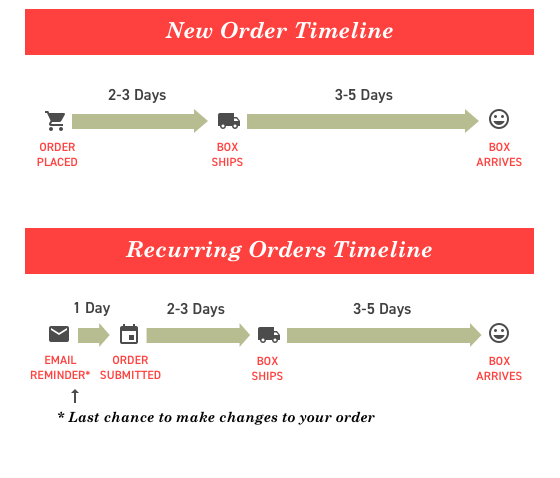 For orders that recur every 2 months, it is the same date on the corresponding delivery month. To change your billing date, click this button to visit your account page.